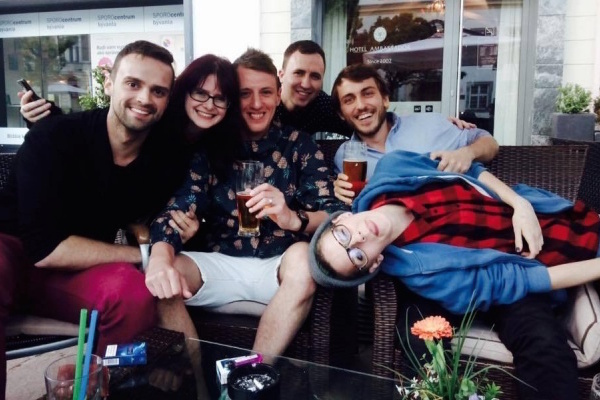 Volunteer Andrew on Sharing is Caring, a LGBTI+ activist event in Slovakia. Sharing Is Caring, aimed to bring together LGBTI+ activists from across Europe so as to facilitate exchanges of ideas, sharing of best practice, network building to alleviate overlaps in work and to enhance the European dimension of our work through firsthand experience. As a LEAP volunteer focused mainly on policy and youth engagement within sports, the course was an excellent opportunity to develop my campaigning skills in that role, make contacts and gain some experience of the Erasmus+ programme to the benefit of LEAP themselves writing future Erasmus+ projects. In meeting each of these goals I found the course to be hugely successful. Productive discussions were held on different approaches to activism, intersectionality within the community, the benefits of non-formal and informal education (especially in reaching those most marginalised) and the landscape of LGBTI+ activism across Europe at present. Additional practical topics including effectively organising campaigns, assigning roles among team members and finding funding all complimented the ideological aspects of the course. Participants were encouraged to share advice amongst ourselves, drawing from our own backgrounds and activist experiences in discussing ideas for future projects. I left with a comprehensive outlook on what activism can look like. On a personal level, the course was quite affecting. As both European citizens and LGBTI+ people (and a few allies), our meeting and collaborating on projects was itself something which populist right-wing forces across Europe sought to prevent on both fronts. Against that backdrop, I realised that simply being able to meet and get to know other community members on the EC’s ticket was itself politically charged; I noticed a sense of defiance and hedonism among the participants. While the potential threat that those forces represent shouldn’t be underestimated, that kind of hedonism is, I think, not just healthy but essential for our wellbeing as members of communities under attack. Other points which stood out included the challenges that can arise in upholding a safe space; I noticed a marked difference between arguing for those policies and actually participating within such a space. I realised that upholding a safe space is an ongoing, ad-hoc, pro-active process, which is directly contingent to your own privilege. To explain, I found that creating a safe space translates not only into managing your own contributions so as not to dominate discussions – which is easy and straight forward – but also knowing when to actively step forward and take on an issue or problem, as each situation requires. This could mean handling questions from more privileged participants which those more marginalised may find taxing or exhausting, while also ensuring that you don’t deprive those who want to respond an opportunity to do so. It could mean intercepting micro-aggressions, or responding to resistance to the use of safe space policies themselves. The key element I found was striking the right balance. I would recommend a course like this to any volunteers looking to develop their skills in building and practicing inclusivity within LGBTI+ spaces, or to develop their campaigning skills more generally. The course left me with a few threads to pursue where safe spaces are concerned, as well as in relation to good ally-ship in general. These include looking at the extent to which a fairly good knowledge of mental health is necessary for good ally-ship, as well as finding ways to connect the history of LGBTI+ liberation – without the whitewashing and cis-washing – with our current campaigns. I expect that volunteers of either lesser or greater campaigning experience would gain a lot from the experience, as the coverage of the ingredients of activism was complimented well the opportunity to create and discuss new project ideas. I would also recommend the course for the opportunity it provided me to ‘ground’ the idea of being part of an inclusive, cross-border community. The Erasmus+ programme sits well with LEAP’s principles in that it aims to provide particularly marginalised young people with opportunities to develop their skills, grow their self-confidence and see some of the world, just as it enables activists to broaden and strengthen their work. The course delivered on each of these principles and created a space in which that community could come together in person. Being able to spend time with other activists in that environment was a privilege. Written by Andrew Marshall on 11th November 2016. Andrew is part of the volunteer team at LEAP Sports Scotland with a specific focus on policy and on youth in sport issues. Andrew has also been part of the support team for our European work and this year has represented LEAP at events in Slovakia and Bulgaria. If you are inspired by Andrew's story, you might want to check out our upcoming European project in our news section.